Diagnosing feline food allergies takes some time, but is certainly worth it – once you have found the allergy-causing foods and taken them out of your cat’s diet, you will notice a remarkable improvement in your cat’s life quality. And if your cat is important to you, you shall also feel happy at the result. If other illnesses have been ruled out (such as sarcoptic mange), then it is time to find out if your cat’s itchiness and miserable condition is caused by feline food allergies. The only reliable way to check if your cat has a food allergy is to use food elimination test. There are blood tests, but at the moment they are not reliable. Also allergy shots cannot be used with feline food allergies. It will be wise to discuss your cat’s symptoms with your vet – a physical examination will be performed to your cat, and the vet will ask you about the cat’s medical history. This is important because some medications reduce the cat’s ability to metabolize certain nutrients. This, in turn, may cause the cat to develop a food sensitivity. The vet, of course, needs to rule out other illnesses that might cause skin problems, such as arthritis, contact / inhalant allergies, ear mites, fungal diseases, hormonal imbalances, mange and scabies. Once this is done, it is time to search for feline food allergies. The food elimination test begins by putting the cat on a hypoallergenic diet. The cat is put on a special diet for two to three months (sometimes even four), as it takes about eight weeks for the reactions from feline food allergies to vanish – or at least be reduced significantly. As it is proteins that mostly cause feline food allergies, the exclusion diet starts with proteins the cat has not eaten before (like duck, rabbit or venison – or even salmon, though perhaps that is not the best choice as fish is such a big cause of allergies). Also as the cat needs carbohydrates, these should be included in this bland diet, but a new carbohydrate source should be used (like potato). So a new protein and a new carbohydrate source – and this really means new. These should be something the cat had never eaten before. This of course gets more difficult as many of us want to give the cat some diet variety, and so we are buying all sorts of exotic flavored foods to our cats. So considering feline food allergies it almost makes you wonder if it might be wiser to decide from the start to feed the cat with only a few proteins (but not only one). If the cat then develops an allergy to these with time, there would be new protein sources still “left” for it to eat. This hypoallergenic diet can be homemade or commercial. Most special commercial foods will do (try to choose non-grain canned food to start with). 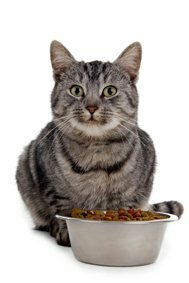 If homemade cat food is your only option, a veterinary dietician should be consulted as it is important that the homemade food has the correct amount of vitamins, minerals, proteins and other nutritional ingredients. A very good source of recipes is www.balanceit.com/ (you will find expert advice by the American College of Veterinary Nutrition). The important thing to remember is that if you make your own cat food, you do not give your cat human food, it can be downright poisonous to your cat (for example onions). Simply changing the food brand is not enough as most commercial cat foods contain the most common allergens. So remember to change to a completely new protein. And don’t hesitate to ask your vet’s advice. There are also special foods where the protein is “pre-digested” into such small molecular units the cat’s immune system does not react anymore. Giving this hydrolyzed protein food with limited antigens might be your cat’s best choice for the duration of the exclusion diet. And these cat foods you can get from your vet. As we all know, cats can be picky eaters. If you find it difficult to introduce the hypoallergenic diet to your cat, then try the old proven method: start small. Introduce the diet to your cat gradually, first mixing only small amounts of the diet food to your cat’s regular food. Increase the amount with time, until the cat is only eating the hypoallergenic food. Cats do not understand the connection between the food and itching, and may protest if the food they are used to is suddenly taken away. But of course there are cats who are happy to eat just about anything, and you can start the hypoallergenic diet immediately. And remember that when dealing with feline food allergies, this exclusion diet is strict – it means the cat should eat absolutely nothing else than the hypoallergenic diet it is on, or else you will ruin the whole test and have to start all over again. No food from the table, no licking of people’s plates, no crumbs from the floor, no vitamins or treats. If treats are necessary, then give a bit of the hypoallergenic food. If despite every effort the cat manages to eat something else than its strict diet, write down what it ate and when, in case symptoms appear. Remember that many medications also have flavorings, and these can be from a protein source not included in the exclusion diet (fish, chicken). So check those if your cat needs medication during this period – and ask advice from your vet, if specific medications can be taken together with the exclusion diet. As drink it is recommended you would give the cat distilled water. No milk as cats are lactose intolerant. Also it is important to keep your cat strictly indoors during the food elimination trial. Outdoors it can have access to food – people may feed it without you knowing, and there is all sorts of garbage to be found outdoors. If you have more than one cat – or any other animals for that matter - be sure the cat on the special diet does not have access to their food. If necessary, make the cat on food-trial eat in a different room, and take the food bowls off immediately after the other cats have eaten – and wash them immediately. Do not leave them in the sink. After 8-12 weeks time the cat is put back on its old diet for two weeks, and if symptoms reappear, in all likelihood your cat has a food allergy. This is called provocative testing. If the symptoms come back with the old diet, put the cat back on the hypoallergenic diet until the symptoms go away and then introduce a single protein to the cat’s diet for two weeks. If during this time the cat shows no allergy symptoms, the protein is safe to eat. And of course – if symptoms reappear, you should exclude that particular protein from the cat’s diet. Wait for the symptoms to subside and then introduce another protein and so on. Slowly you will find out what your cat can and cannot eat. If the exclusion diet does not seem to work, it could be your cat has inhalant allergy instead. Or it could actually be allergic to the original protein you are using in the food elimination test. So choose another basic protein and start again. The problem with feline allergies is that the cat can be allergic to many things simultaneously. So even if your exclusion diet does work, your cat may show symptoms of some other allergy. This is why it is important to work in cooperation with your vet. There are certain supplements that help in calming down your cat’s immune system and the histamine amount, and help the skin in healing. These are Omega3 fatty acids (do not give other Omega fatty acids, only Omega3). They are especially effective when given together with Biotin. Usually food elimination is enough to get rid of the symptoms of feline food allergies, but if the symptoms are severe, antihistamines and corticosteroids may be used. But use these on your cat only if recommended by a vet, and do not start this medication on your own. Still, food allergies don’t react very well to cortisones, and the itching is not easily dealt with using medicines. A calming shampoo may also work to ease the itching of feline food allergies. Shampoos with shea butter and/or oatmeal have been known to be effective. And once you have found what causes your cat’s food allergy, remember that only a permanent diet change will keep your cat healthy. You can never again give your cat the protein it is allergic to – even if it loves it. 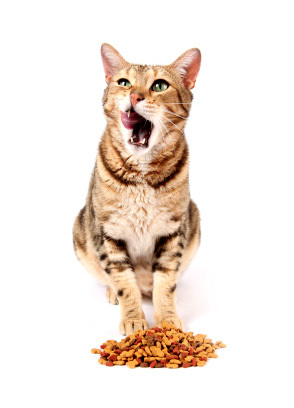 Stick to what the cat can eat, and your cat can have a healthy, symptom-free life after that. 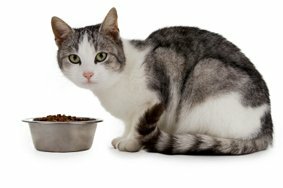 It might also be a good idea to rotate foods - rotational diet may reduce the likelihood of your cat developing new food allergies (as it seems to be the amount of exposure that triggers the allergic reactions – what the cat eats most is also most likely to cause a food allergy in the future). Natural health supplements for cats. 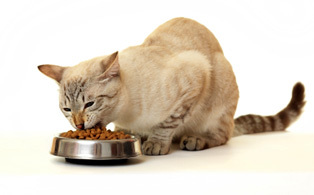 about treating feline food allergies?